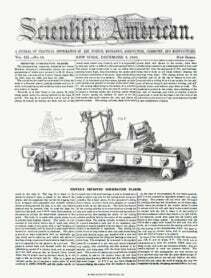 The following inventions are among the most useful improvements latelypatented:- ROLLING IRON AND STEEL W IRE. This inven tion (patented by Joh n Wright, of Sheffield, England) consists in winding the wire to be reduced on a cast iron bobbin or reel, which is then placed in a box of the same metal ; the whole is then placed in a furnace and heated to a required degree ; after heating, the box is placed i n close proximity to the rolls by w hi ch the wire is to be reduce d, and the whole length passed through and rolled flat, as for watch springs or crinoline steel, or of other desired form ; by this m eans, long lengths of w ire m ay be reduced with great facility . The box is formed with a spout or channel, at whi?h the wire is dralVn out ; the bobbin or reel is mounted on a spindle within the box, so as to afford sufficient freedom for unwinding the heated wire. CULTIV ATOR; It is well known to agricul turists that the ordi nary cultivators, which are employed for pulveri7.ing the soil and eradicating weeds from growing pl an ts in hills and drills, inj ure the young and tender roots which ate near the surface of the grou nd, and which serve as the main fe eders fo r the plants. The object of this inven tion (for w hich a patent has been issued to James H. and Edward H. Anderson, of Easton, Md . ) is to obviate t hi s d ifficul ty, and, at the same ti me , cause the earth to be thoroughly pulverized and loosened. To this end, the inventors employ a calit metal, or a wood en shoe shod with m etal, provided with suitable handles, a nd ha vi u g a toothed cy linde r behind it, all constructed and arra n ge d tQ effe ct the desired end.